Samuel OSBORNE was baptised at Merriott, Somerset, England, on December 29, 1833, the fifth and last child of Joseph and Mary (nee Lawrence) Osborne. As older brother Joseph was baptised on July 31, 1831, it seems likely that Samuel was born after this date. and Samuel aged 8. The whereabouts of Joseph snr, and older sons Robert & George is not known at the time of the 1841 census. The death of Joseph, snr, has not yet been found. Robert Osborne moved to Misterton, south of Crewkerne, by the mid- 1850s, as did Joseph jnr (eventually). George was transported to Van Dieman’s Land. Read his story here. It is likely that Samuel was living at Misterton prior to emigration to Queensland, as he married Mary Ann MOUCHER there in 1857, the year first son George Enos (or Amos) was born. The young family came to Queensland on the Alfred, which arrived in Moreton Bay on the 19th of September 1858. The Alfred was a ship of 1278 tons, and this voyage brought 435 immigrants. It was only a year before the colony was separated from New South Wales, with the new Queensland being officially born in 1859. [Samuel signed the petition of May 1859 to the Government of New South Wales to request the separation of Queensland from New South Wales]. The voyage lasted 90 days from Liverpool; there were five births and six deaths noted in the Shipping intelligence of the Moreton Bay Courier. Only one days’ rough weather was experienced on the voyage. Mary Ann’s sister Sarah MOUCHER was also on this voyage. Other sisters Dinah and Elizabeth MOUCHER also came to Queensland on separate voyages; they were to live much longer lives than their ill-fated sister. Mary Ann must have been either just pregnant, or about to become pregnant, as next son Joseph Henry (registered as Osbourne) was born on 12th May 1859 in Queensland. Mary Ann died on 27th of the same month, at Fortitude Valley, where they were living. Joseph Henry died on 17th July of the same year. It may be a coincidence that there is a Misterton Street at Fortitude Valley in Brisbane to this day. At some time after Mary Ann & Joseph Henry had died, Samuel went to Melbourne, where he remarried on 25th May 1860 (Fanny HARRIS, a previous resident of Upper Chelsea, London), at the same time as his older brother George OSBORNE married for the first (perhaps only) time (Ann MULRAINEY/MORONY– a native of Dublin, Ireland). How the brothers met up is not known. In the following year, at Ryrie St, Collingwood, Melbourne, Samuel’s son George Enos (aka George Amos) by his first marriage to Mary Ann MOUCHER died. The first son in Samuel’s second marriage, Henry George Osborne, was born at Collingwood, Melbourne on July 6th, 1862, but not registered until 21st August, 1862, when the family were in the district of Port Curtis (Gladstone, Queensland). One wonders what the trip was like for the post-partum Fanny- a distance of approximately 2,500 km. At this time, Samuel’s brother George had his first child, Samuel, on Diamantina Station, Port Curtis (born 1st May 1862, registered 23rd July 1862 at Gladstone). Presumably Samuel had travelled north to meet up with his brother, who was working as a labourer on Diamantina Station. It seems likely that the two brothers were quite fond of each other, if the naming of their children is anything to go by. 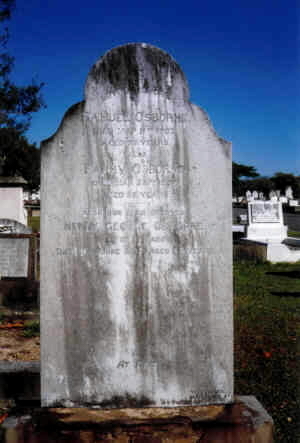 The next record I have relating to Samuel & Fanny OSBORNE is of second son Frederick’s birth in 1864 near Newcastle, New South Wales – approximately 1300 km south of Gladstone. The registration was carried out by a Jane Partridge, by Frederick’s parents’ authorization. The certificate shows Samuel as a 29 year old Milkman (he would have been about 31). His being a milkman is not corroborated by any other information at this time, but it may have been a temporary occupation. The certificate also shows him as having married in 1860 in New Zealand (which is not correct). His third son, Alfred John Osborne (possibly named after the emigrant ship Alfred) was also born near Newcastle, in 1866. His birth certificate shows Samuel as a dealer, aged 31 (he would have been about 33). The Alfred was the same vessel which brought other relatives of Samuel to New South Wales in 1857. These included William OSBORNE, his wife Hannah SWEET, and a cousin of theirs, Joseph OSBORNE , with his wife Mary Ann LAWRENCE. Another cousin, John Cribb OSBORNE, had migrated to Geelong in 1849. Other Osbornes arrived in 1858 as assisted immigrants – uncles, aunts and cousins to William Osborne mentioned above. All were descended (as was our Samuel and George), from the original Osborne to come to Merriott in the 1600s – Alexander Osborne. As all these families came from Merriott and were related, it seems likely that Samuel met up with his cousins when he moved with his family to Newcastle. William and Hannah settled at Honeysuckle Point, from which place the Jane Partridge mentioned above as registering the birth of Frederick in 1864 came from. Our Samuel’s cousin, also named Samuel Osborne, drowned in the Williams River near Seaham, upstream from Raymond Terrace on 27th July 1864. See: Osborne to New South Wales, Australia and Osborne to Victoria, Australia for more detail. All these places would be considered “inner city suburbs” of Brisbane in this day and age, but were not considered so one hundred years ago. Samuel died at Maud Street, O’Connell Town, (now Cartwright Street, Windsor) on March 11th, 1902. His death certificate was signed by son Henry George, living at Maud Street. The age on his death certificate (74 years, i.e. born about 1828) does not tally with other ages given during his life for various registrations. If we believe the baptismal date as being the most correct, his age at death would have been about 68 years. Samuel predeceased his second wife, Fanny, by only five years. 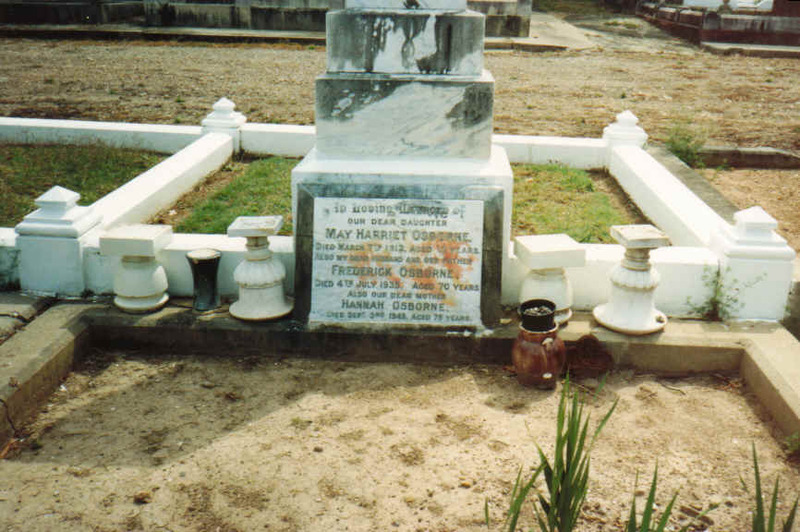 They are both buried at Lutwyche Cemetery, a few kilometres down the road from Maud Street, with their son Henry George Osborne – the large headstone is clearly visible from the main road through the area, Gympie Road. All three of Samuel & Fanny’s sons were Shoemakers. The eldest, Henry George, did not marry. The youngest son, Alfred John Osborne, married Harriet Dangerfield. The middle son, Frederick George, married Hannah Weatherill, daughter of another Shoemaker, Walter Weatherill, who brought his family to Queensland from Yorkshire, via Manchester, in the 1860s. Hannah herself was born in Charlotte Street, Brisbane, in 1870. Neville Edward, was my husband’s father. and their daughter May Harriett. 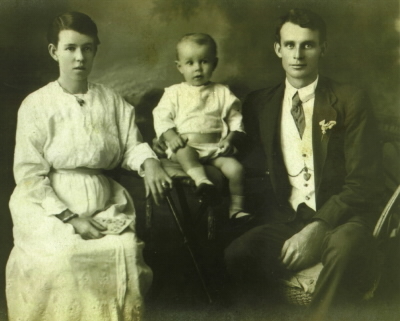 Here is a photograph of Frederick George & Ada Mary OSBORNE, taken about 1917, with their first son, Roy Osborne, born 1915.